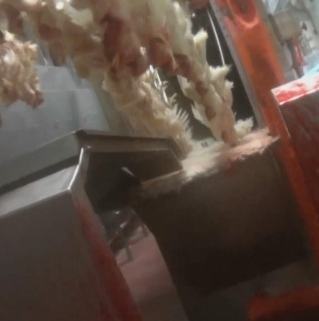 TORONTO – On Saturday evening, CTV’s W5 aired disturbing undercover footage of chickens being abused, apparently in violation of federal and provincial law. The footage was shot at one of Canada’s largest slaughterhouses, owned by Maple Lodge Farms. Maple Lodge Farms is currently on probation following convictions in 2013 for 20 counts of animal cruelty offences under the federal Health of Animals Act. Moreover, in the first three quarters of 2014—the year following its conviction—it was fined for 14 separate animal welfare violations, significantly more than any other company in Canada. Animal Justice Canada, a national charity that works to encourage enforcement of animal protection laws to prevent animals from abuse and killing, is now calling for charges against Maple Lodge Farms. “Federal humane handling policy prohibits throwing and dropping crates of live chickens, shackling sick and injured birds for slaughter, negligently sending live animals through industrial washing machines, and allowing animals to dangle by one leg through the slaughter process,” said Anna Pippus, director of farmed animal advocacy for Animal Justice. To view the undercover footage, please visit: www.MapleLodgeHarms.ca.